Liv Life: Banana Apple Spice Bread... Pure Comfort! What are some of the words of wisdom that you've passed to your kids over the years?? Things like, "Make good choices" or "If you don't have anything nice to say don't say it" or "Don't settle for someone who doesn't treat you like a Princess"... etc. etc. Or how about, "Choose your senior yearbook photo carefully because 30 years from now the committee may put it on a name tag at your reunion." The last piece of advice I learned firsthand last weekend when I attended my 30th (gasp! Yes... 30th) High School Reunion. We were the Class of '83, a time when Swatch's were used to tell time not cell phones, when The Moonwalk was cooler than Twerking, and when no one knew who Anakin Skywalker was but we all wanted an Ewok for a pet. 1983 also brought a young Tom Cruise to the scene in Risky Business, an awesome Vacation with Clark Griswald, and a flood of tears when watching Aurora in Terms of Endearment. And "What a Feeling" it was to see Jennifer Beals in Flash Dance (yes... I had a shirt just like hers!). I also wanted one of those Vegemite Sandwiches from a land "Down Under", and I really wanted to know... who was Billy Jean? In any case... we've all come a long way, and what it treat it was to see nearly half of my graduating high school class. With 30 years passing, those name tags really did come in handy as we all tried to covertly peek (not so easy without putting on those reading glasses we didn't want anyone to know we use) so we didn't seem to have forgotten anyone. The girls were gorgeous and the men handsome as ever, and for the most part friends picked up where they left off at the last reunion. At this point in our lives most of us are comfortable in our own skin and just happy to see old friends. Laughter could be heard the whole night through and many of us had a hard time saying goodnight. All this is a testament to our incredible reunion committee. Putting in months of work so the rest of us could fly in at the last minute to enjoy a wonderful evening, the committee put together an incredible event. 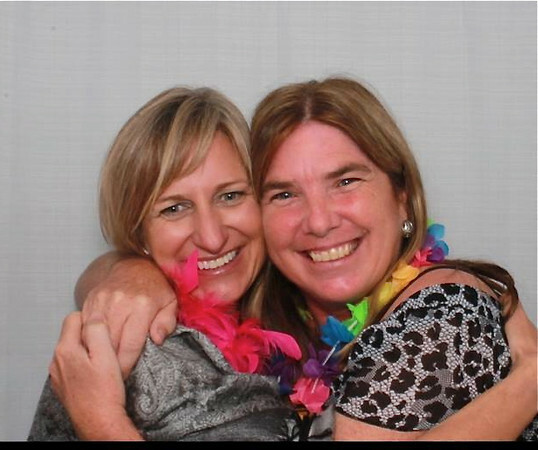 Friends for over 35 years... Love you Suzanne!! Arriving on my own and admittedly a little nervous (would anyone really remember me? ), the first face I saw immediately put me at ease with a big smile and a welcoming hug. Thank you, thank you to the committee for all the work you put into the evening and for immediately making me feel comfortable. Thanks to the wonderful friends I hadn't seen in years, I enjoyed catching up with each and every one of you... I'm eagerly looking forward to our 40th! How lucky am I to be a part of such a wonderful group of people?? And comfortable is exactly how this bread will make you feel. 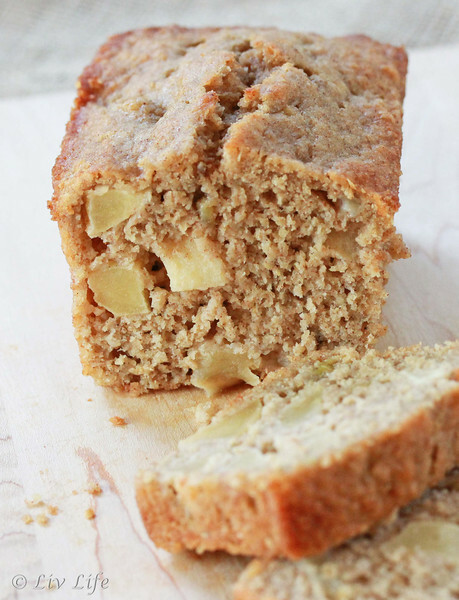 Bringing the soothing flavors of fall, this Banana Apple Spice Bread studded with soft chunks of cinnamony apple will leave you with a smile on your face and a friend in anyone you choose share it with. With both kids asking for seconds, this sweet bread ranked an immediate hit. Moist and with a tender crumb, I love the whole grains giving it substance, the fall-flavored spices are just a bonus! In a large bowl add the flour, bran, flax, baking powder and spices. Whisk to combine. In a medium bowl, add the oil and brown sugar and give it a good whisk to combine. Add the eggs, whisking again to combine well. Add the milk and vanilla, once again whisking well. Stir in the mashed banana. Sprinkle the chopped apples over the dry ingredients, then pour the wet ingredients into the dry ingredients and stir gently, just until barely combined. Pour the batter into your prepared loaf pan (or mini loaf pans, or muffin tins) and sprinkle with raw sugar (1 - 2 Tbs), then place the pan into the hot oven. Bake until the bread is golden brown on top and a skewer inserted into the center comes out clean. Remove from the oven and tip onto a wire rack to cool. Slice and serve! Note times may vary depending on the size of your pans... keep an eye on the bread as it bakes making sure not to overcook. * Liv Life Note: If you don't have apple pie spice, substitute 3/4 tsp cinnamon, 1/4 tsp nutmeg, 1/8 tsp ginger, 1/8 tsp allspice and a pinch of cardamom. 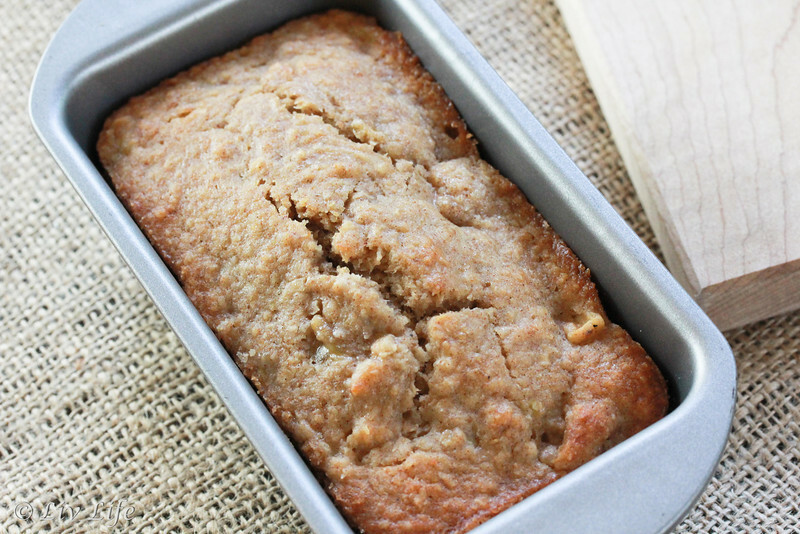 Oh, my gosh, you've made banana bread even better! YUM. And I was 4 years ahead of you, so your high school memories were my college memories...fun times. It's fun to look back at what was popular the, isn't it?? Somehow it doesn't seem all that long ago...! 30 years I find that hard to believe, even harder if I wasn't right behind you. You look great and I love that yearbook photo. If only we knew then what we knew now. Like make more breads like this more often, it would solve more worldly problems. Looks like a great time. Agreed Gina!! I think the government would be in a better place if they served this for lunch!! Thanks Krista!! My kids are mortified that I put that photo up!! I know right?? The time goes quickly. Hope he enjoys his as much as I did mine!! Thanks Erin!! It really was so fun!! I love your class picture!!! You look so young and beautiful, Kim! Your banana bread looks great with apple and fall spice. "Comfort" is nicely packed in this bread! oh WOW, Kim!! your class photo looks JUST like one of my dear friends growing up!! crazy resemblance! great advice about choosing a good photo - of course you want a good one at the time, but you're not thinking about many years in the future! this bread sounds amazing - looks amazing - cannot wait to try! Somehow I remember looking at the photo and thinking it was a really good one... my kids are still laughing!! The pictures are so sweet. Very precious. Both you and your friend look lovely. The banana cake looks good and like the chunky apple bits in it. I agree it is a comfort food. Thanks Asha! She is lovely... I'm so lucky to have those girls in my life!! 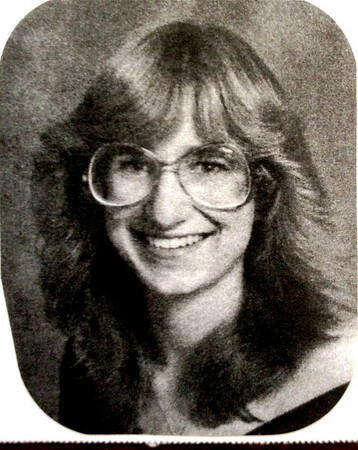 Your reunion memories are priceless, as well as your yearbook pic. I'm way ahead of you in in reunions, but your are gorgeous in the pic with your friend. I love the "friendship" Banana Bread! I recall seeing a recent social media post of yours about you boarding the plane for this reunion...it's fun to see the follow-up to it and the great time you had. This breads looks scrumptious, especially with the generous chunks of apple. Nice work my friend! I blasted Instagram that weekend... Mommy doesn't get out of town very often, so it was fun to show travel! I'm glad that you enjoyed your reunion!! Oh I remember swatch watches (back in style as you probably know). Time has gone by so fast with so many memories and stories to share! I bet you all could have talked all night together. Now I'm wishing I had saved that watch I had!! Love those big glasses - what fun going to your reunion! And your bread sounds amazing - can't wait to try this! 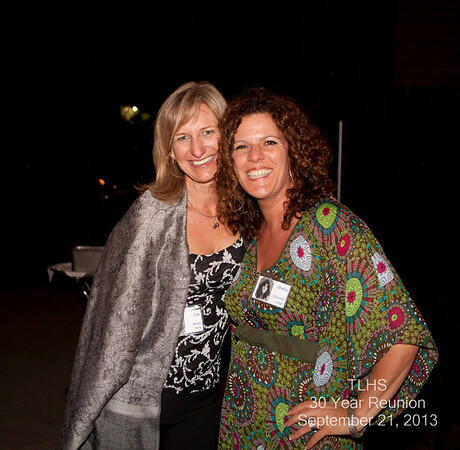 How fun to go to your 30th reunion. My sister graduated in 83 too and oh I remember all those things you mentioned above. Isn't fun to see all the old friends and what's crazy is on the inside we still feel like kids but the outside is just no cooperating :). Thanks for sharing this fun post and your delicious comforting bread too.